Lauded by the NY Times as “dramatic . . . emotional . . . evocative”, and promoted by ABC of Madrid as a “magnificent violinist and violist who is a dedicated promoter of Spanish music”, Laura Klugherz made her Carnegie Hall debut to rave reviews in 1989. She studied in the U.S. and in Europe as a Fulbright scholar where she subsequently performed during many years as Concertmaster and soloist of the Munich Chamber Orchestra and the Munich Bach Orchestra. A recipient of numerous awards and prizes (Fulbright Post-doctoral research Award, Spanish Ministry of Culture Post-doctoral Award, Juenge Kuenstler of Bavaria, San Jose Symphony Young Artist Award, Juan Morales Prize of Spain), she performs as a recitalist throughout Europe, Latin America, and the United States. 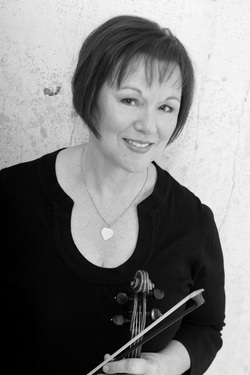 As a chamber musician, she performed for many years as violinist of the Trio Ciudad de Sevilla, the Morrison String Quartet, and she has collaborated with many of the finest chamber music ensembles, including members of the Beaux Arts Trio, the Raphael Trio, the Cuarteto Latinomericano, and the Lydian Quartet. Ms. Klugherz has been on the faculty of the Raphael Trio Summer Chamber Music Seminar at Adamant, viola professor for the National Youth Orchestra of Spain, and is currently violin/viola professor at the Lake Placid Institute. Regularly in demand as a violinist/violist, Ms. Klugherz has performed regularly at such festivals as Banff, Juneau Jazz and Classics, Olympic Music Festival, Santiago de Compostela (Spain), Festival Internacional Hispánoamericano de Guitarra (Mexico) and Festillésime (France). As a Cultural Specialist for the United States Information Agency and sponsored by the Fundación Andes, she has performed solo concert tours and residencies throughout Latin America. She has released the CDs: The Violin and Viola Music of Amy Beach (Centaur), Echoes: Viola music of Africa and the Americas (Centaur) and Three Lyric Pieces, Dance Bagatelles on Dexter Morrill’s Music for Strings (Capstone): and is the author of A Biographical Guide to Spanish Music for Violin and Viola (Greenwood Press). Named one of the 10 best of 1998 by the Oregonian, the Beach recording garnered national attention as soundtrack to Ken Burns’ recent PBS series “The War.” Selected as a Perkinson Fellow to the Center for Black Music Research at Columbia College (2006), Professor Klugherz has researched, edited and arranged little known African and African/American music for viola. As a specialist in contemporary music for violin/viola of Spain, Africa and the Americas, she regularly commissions and premieres new additions to the repertoire. Professor Klugherz was the artistic director for Retiro Contulmo (Chile), guest professor at the Instituto de Música, Universidad Pontífica Católica de Chile and is the founder and director of the Chenango Summer MusicFest (now in its thirteenth season). Prof. Klugherz is a registered Hatha Yoga teacher, and a Guild Certified Feldenkrais instructor, and as a specialist in the use of somatic systems for the performing arts, she regularly combines her concert tours with somatic workshops for artists. She was recently recognized as Presidential Scholar at Colgate University for her outstanding performance, scholarship and service. Laura Klugherz’ education includes an Artist Diploma from the Bavarian State Conservatory and a Doctorate of Musical Arts from the University of Texas. She is currently Professor of Music and Africana/Latin American Studies, and Director of the Colgate Chamber Players at Colgate University in Hamilton, New York.